Adriaan has notified me of the following free reports that he has published (see below the diagram). The axial flux design has a single magnet disk, and a steel plate behind the stator coils, so the eddy current losses are pretty high (22 watts measured for an 80 watt turbine). The advantage (compared to the twin-rotor design that I use) is a a supposedly simplified construction. The magnet gluing is a potential failure point at high rpm. I have some concerns about the use of thin metal plate in the support of the blades (fatigue). These are meticulously mathematical reports which will be invaluable to the diligent student. The theoretical work is a great lesson. Recently I have placed three new KD-reports, a manual and a new list of public KD-reports on my page of the website of Bidnetword: www.bidnetwork.org/en/member/adriaankragten This material can be copied for free by anybody. KD 571 gives the description and measurements of an 8-pole, 3-phase axial flux permanent magnet generator and the calculations of the rotor and the head of the VIRYA-1.36 windmill. Manufacture of the parts and a complete set of drawings of this windmill are given in a separate manual. KD 574 gives the description and measurements of a 6-pole, 2-phase axial flux permanent magnet generator and the calculations of the rotor of the VIRYA-1 windmill. 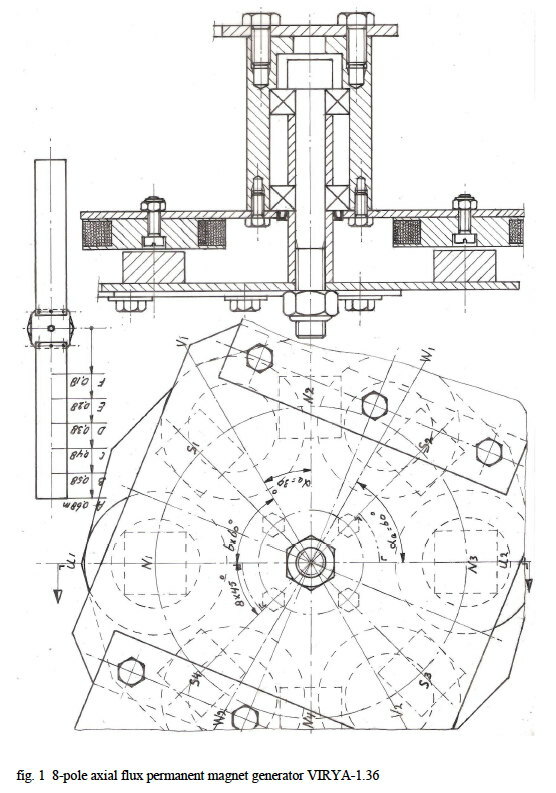 This report also contains the drawings of the generator and the rotor. This generator is an alternative for the Nexus hub dynamo of the VIRYA-1.04 windmill which is described in an earlier public manual. KD 340 is an older report in which rectification of the generators of the VIRYA-windmills is described. Recently a chapter about 2-phase rectification is added because this is used for the VIRYA-1 generator. In the list of KD-reports, all public KD-reports are given. 24 KD-reports and two manuals can now be copied for free from my page on the website of Bidnetwork. 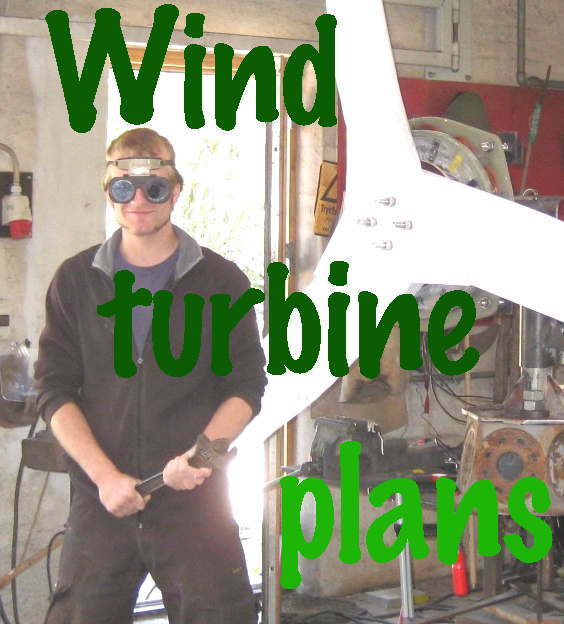 I am retired now for almost three years and I no longer accept large engineering projects but through these free KD-reports I try to make that the knowledge gained by 40 years of experience with small windmills is not lost. Questions about small windmills asked by people from developing countries will be answered for free if answering takes a limited time. Nice that you have put my message about the three new KD reports on your blog. Your comment is OK but I can say the following about it. It’s true that there are substantial losses in the stator due to eddy currents but the copper losses in the winding at maximum power are much larger. At low powers, both the copper losses and the iron losses are low and then the generator efficiency will be rather high (I expect about 75 %). For a small windmill mounted at a low tower, enough power at low wind speeds is more important than high power at high wind speeds. The big advantage of a non rotating steel stator sheet is that you can use separate coils bolted to the front side of the stator sheet and that the wire ends can simply be guided to the rectifier by a hole in the sheet. At this moment a prototype of the VIRYA-1.36 is being built by an Indian company and they will try to measure a complete generator. Once I know the measured characteristics, I will add a chapter with these characteristics to KD 571. It’s right that the blade is rather thin (1.5 mm) where it is connected to the armature sheet. But therefore the rotor is very flexible and this almost flattens the fluctuation of the gyroscopic moment which is typical for a 2-bladed rotor. The bending angle due to the thrust is strongly reduced by the centrifugal force in the blade and this reduces the bending stress in the blade root. The VIRYA-1.25, which has almost similar blades, has been tested for more than ten years and is still running without any problems.